Saturated fat contains triglycerides that consist only of saturated fatty acids. They are called "saturated" because there are no double bonds between the fatty acid chain and the carbon atoms, meaning the carbon atoms are fully filled or saturated with hydrogen atoms. Saturated fats have a numeric name that represents the number of carbon atoms within the saturated fatty acid chain. Fish oil - menhaden and sardine oils are 30% saturated fat, cod liver oil is 23% saturated fat, herring oil is 21% saturated fat, and salmon oil is 20% saturated fat. Next time you go to the grocery store, look for these different types of foods to see lots of real-world examples in saturated fats. "Examples of Saturated Fat." YourDictionary, n.d. Web. 19 April 2019. 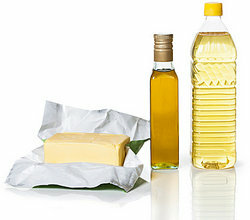 <https://examples.yourdictionary.com/examples-of-saturated-fat.html>.